petit pas! are a fairly recent discovery for me. I have the criminally under-appreciated Homicidols to thank for that in particular so shoutout to yer man over there for posting all of those SoundCloud links a few months back. I’m always trying to get into new groups, but life increasingly gets in the way these days so I’m glad there’s other people out there in the community spreading the word and bringing interesting things to peoples’ attention. When it comes to petit pas!, let’s start off with the basics. They’re a 3-piece based out of Tokyo who apparently started their activities together in 2013. If you’re on the CHEERZ mobile app then you’re probably familiar with at least one of the members. Shinozaki Kokoro reached the finals of the 2015 Miss iD contest and appears to have quite the following (she also wrote all of the lyrics for petit pas!’s first 6 singles). Her musical partners in crime are also on the platform, each having a respectable following of their own. Not bad for a group that most of you have probably never heard of, right? 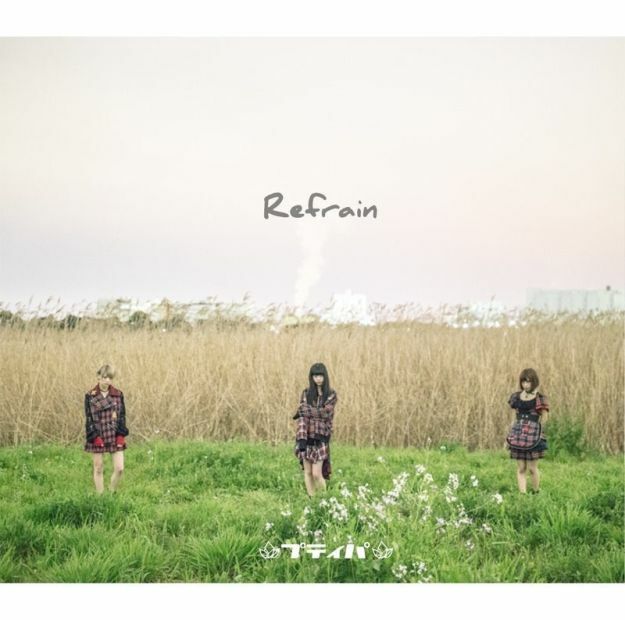 “Refrain” is the group’s first album in their 3 years of existence. It very sensibly decided to collect their modest back catalog of indie singles into one package. For me and most people who haven’t been following their career up to this point, that’s almost enough in and of itself. petit pas! didn’t seem to think so however, and they decided to just give us another half dozen or so brand new songs to check out. Let’s do that now, shall we? “Refrain” is built on a backbone of Rock and Roll, many of the songs are very guitar driven so if we were to paint in broad strokes we could say that this is petit pas!’s comfort zone. That being said, Rock and Roll isn’t the only thing you’re going to hear on the album. We’ve got synthesizers, pianos, Punk, Metal, Pop, Ska…you get the idea. There’s a lot of dimensions to this release which is obviously a good thing. If I had to pick one thing that stands out the most on this album I would have to say it’s the vocals. There’s a lot of variety and range on show, which helps to give the songs a bit more personality. It doesn’t come across quite as well live from what I’ve seen, so please don’t judge the album entirely on the videos provided here. The instrumentals are also of a very high standard, something that still surprises me out of these groups with significantly less budget than the more well known ones. Being passionate goes a long way I guess. I honestly don’t think there’s a single bad song on this album, although it’s not without problems. Personal favorites include “BORDER” which is how everyone should be doing ballads if I had any say on the matter, “MAGIC” which is just incredible in all regards, “Natsukoi” which appeals straight to the Ska kid that’s still hidden inside me and “Answer” closes the album out with my absolute favorite genre of music in the entire world, Punk Rock. So I said this album had problems right? Well, it’s more like it has one problem that affects several songs. I can’t fault the production, recording, vocals, instrumentals or anything like that, that’s all great. I also can’t fault any of the songs…individually at least. In a vacuum, they’re home runs all day long. It’s when you start to put everything together that things go a bit awry. Basically what it comes down to is, the songs are great but a number of them do sound rather similar. Unfortunately, they’re all kinda clumped together too so it’s even more noticeable. I enjoy a good Rock song with strong vocals and a hook, I enjoy it slightly less when I hear 3 of them in a row. It’s pretty nitpicky, but it’s how I feel on the matter and this is my review so I can write whatever I want, no matter how pedantic. In all honesty, I’d actually like to maybe have a go at re-arranging the running order of the album to see if it changes my opinion any. If the half dozen or so more interesting songs from the front and back end of the album were spaced out a bit more maybe it’d help to reduce the ear fatigue a little bit. Something to try one of these days when I actually have the free time for such frivolous activities. All that aside, “Refrain” is still easily one of the best albums to come out in 2016, and that’s saying a lot seeing as there’s been so damn many of them and most of them have been great too. I would definitely encourage you to head over to petit pas!’s SoundCloud page where I think you can hear just about every song on the album for free. I don’t think you can get a much better deal than that in 2016. As for me, I’m looking forward to hearing whatever petit pas! decide to release next, whenever that may be. Hopefully they continue to explore what can be done in Rock and Roll and its various sub-genres because they’ve been doing pretty damn well with it so far.